I made these coasters a couple of years ago and they were a hit. Since Superbowl weekend it coming up I thought I would update the pattern. 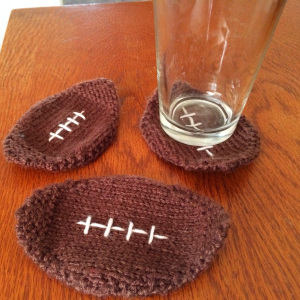 These coasters are a great stash buster that will have you football ready in no time. Enjoy! Finally, football season is coming to an end. No more Sundays dictated by when the game is on. Since I will be heading to a friend’s house, I thought I would whip up a cute little hostess gift. Here is the general outline for my stash busting football coasters. Repeat Rows 1-2 until there are 11 sts total. Row 8: purl across all sts. Cute idea. I need to try and knit up some coaster,too.